Every maker has a story. Be a part of Clay and Steel's story by placing an order, leaving a review, and seeing your review appear here. This piece measures 9W" x 14L" x 12H". It is made out of 3/4" x 3/16" flat stock, slightly wider at the bottom, using 3/16" x 1". This item was lovingly crafted beside a hot forge using a hammer and anvil. The item is entirely hand riveted; meaning it is held together by rivets alone and there is no welding. Made the old fashioned way, using techniques that have been around for hundreds of years. It is then waxed while hot to protect the surface from oxidation and buffed to a light shine. The rack holds three bottles of varying sizes. 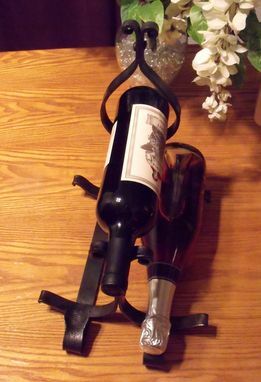 The neck of the top bottle is held in place by two riveted scrolls. The necks of the bottom bottles are held by a clever sled-like feature that curves from the base and forms a graceful crescent. This is an original design and is completely unique. It is sturdy and comfortable to the touch. I have used mine on wood and does not scratch the wood or my wine bottles. It also casts beautiful shadows. I hope you enjoy this rack as much as I enjoy mine.